Having a Garden can save you a lot of money when the garden produce is in season but what about when it is not? The answer to that question is pretty simple. A Metro Pioneer needs to learn how to extend the shelf life of his/her produce. One of the ways to do this is to store certain types of garden vegetables in cold storage. Properly storing garden vegetables in a cold storage area is an awesome skill. Using a cheap cold storage set-up outside plus my basement, I have been able to successfully store carrots, beets, onions, winter squash, and potatoes that I picked in the fall. It is now February 5th and I live in Michigan. That doesn't seem possible does it? 0 variable cost storage. It doesn't get any better than that. In fact, my cheap cold storage idea in the garage has worked so well I have my father in law (the king of garage sales) looking for more coolers for next year so I can expand my stock. The luck I have had this year storing produce is not a fluke. This winter has been super cold with the temps dropping under zero a handful of times. The cold has not had any negative effects on my produce though. My family is still eating meals prepared from produce from my garden. Talk about saving money. That 2 dollar packet of seeds I bought this time last year was well worth the investment. My grocery bill has really went down this year. Next year I am going to add turnips, parsnips, and rutabagas to my stash. This will allow me to save even more. My methods for storing garden veggies. 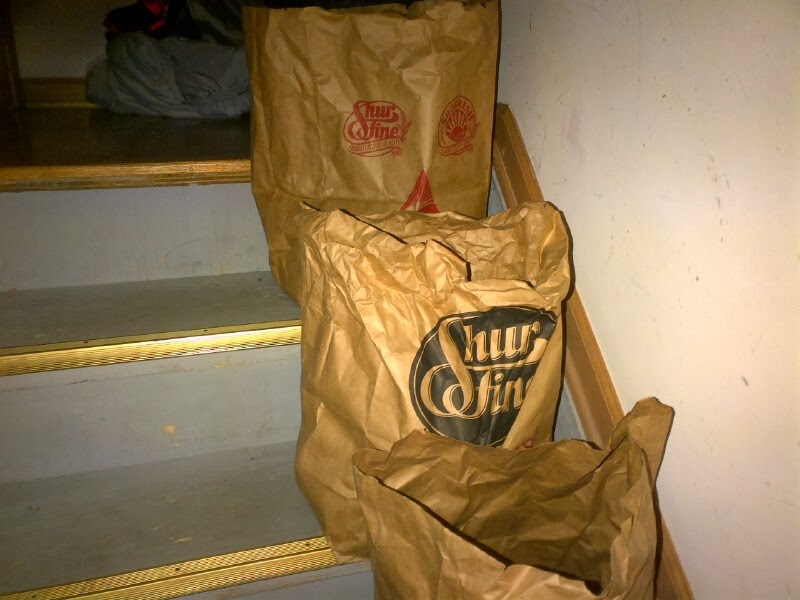 I store my potatoes and onions on our stairwell leading in to the basement. Technically I should have them in one of the rooms downstairs that stays a bit colder but we eat so many potatoes and onions I am not worried that the amount I have will go bad. I could extend the shelf life longer though if they were in a little cooler spot though. 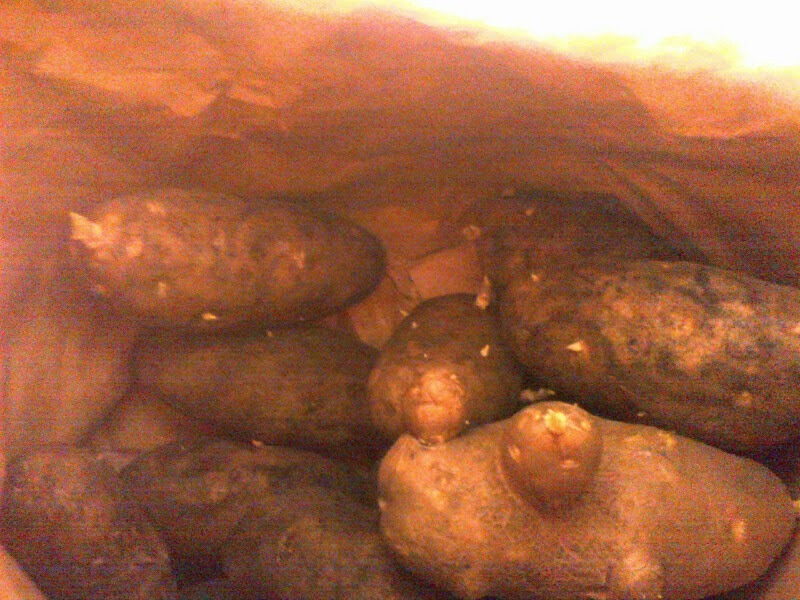 Bags of potatoes and onions. A few are starting to sprout. That won't hurt anything. Again, a few are starting to sprout but that wont hurt anything. 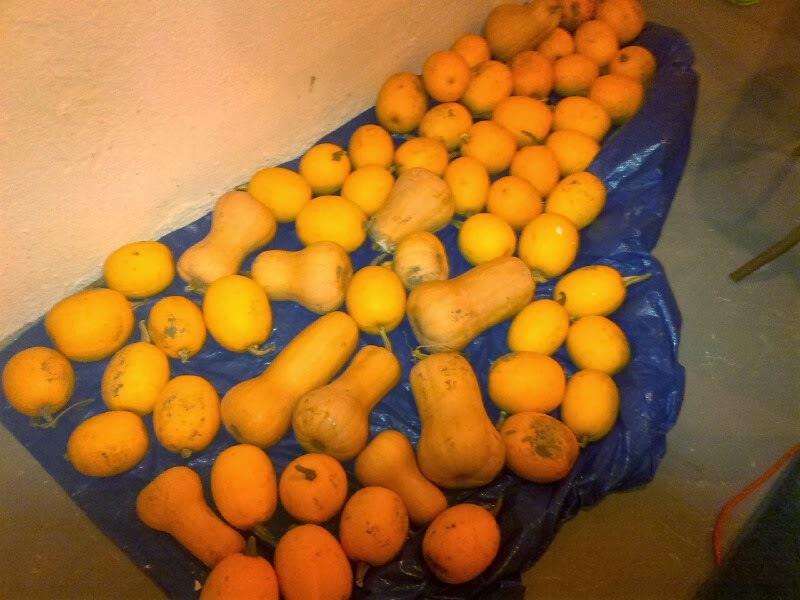 I store my spaghetti squash and butternut squash on the floor of my unfinished basement on a tarp. I read on-line that you should wash the produce with bleach but I did not do that. I simply put all of the squash down so they were not on top of each other. Every once in a while, I notice one that is rotten but I have only lost 3 so far. One thing that is very important to remember is to discard any rotten produce as soon as you see it. This goes for anything you store. Once one starts going bad, the rest will go down that path. Another important thing to remember is to only store the best of your produce. Anything that is bruised/nicked or has a defect will tend to go bad sooner than later. You do not want this to happen. Eat/compost/freeze anything that isn't grade A quality. You can actually see one butternut squash that I noticed was going bad the day after I shot this photo. Do you see it? Now for my outdoor cold storage that I tried this year. 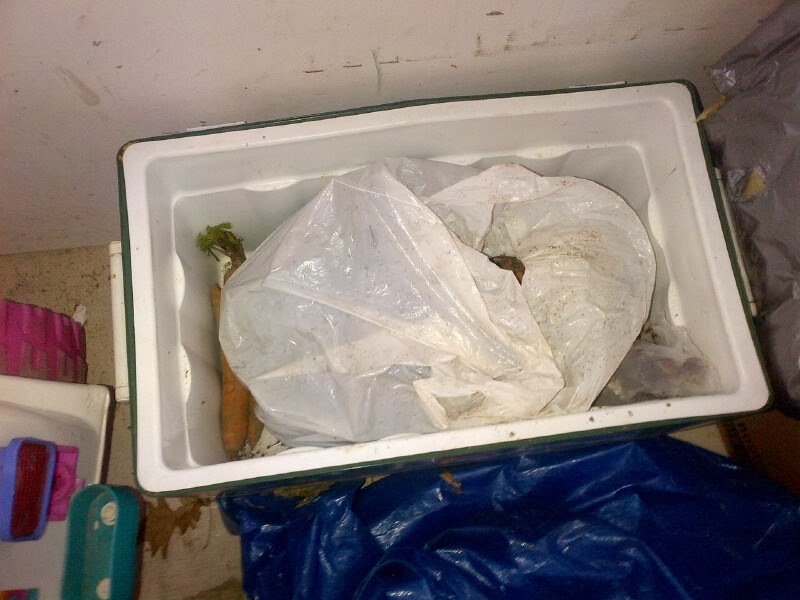 I have my carrots and beets in a cooler that is up against the outside wall of my house in the garage. 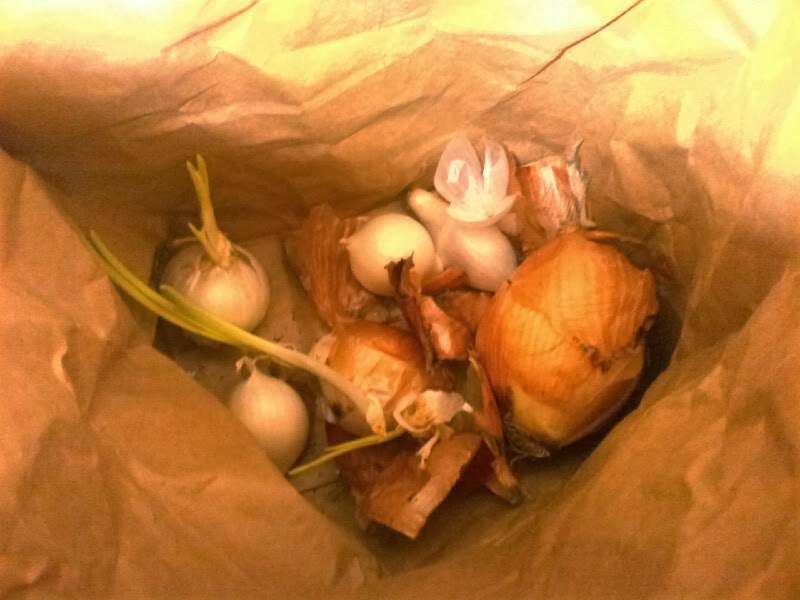 The produce is placed in a trash bag which seems to help make it not shrivel up. 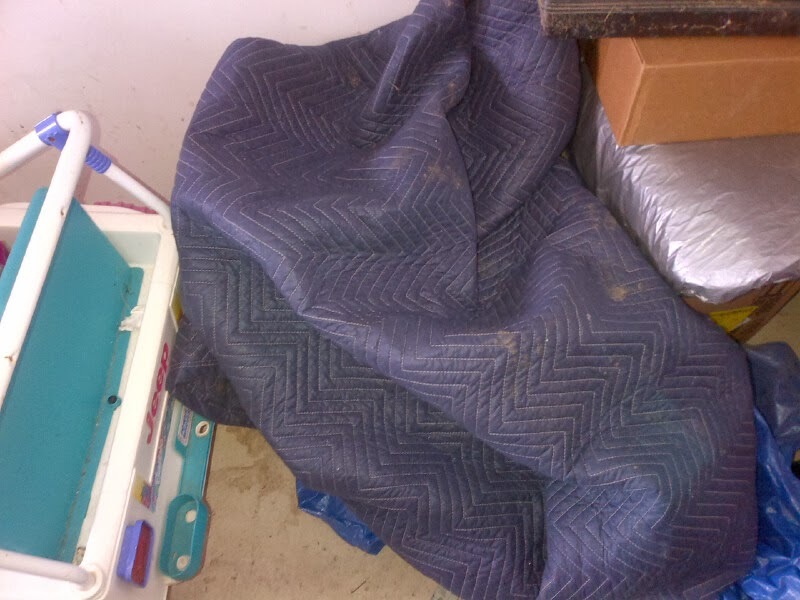 The cooler is then closed with a blanket placed on top of it. My garage has definitely dipped under freezing a few times this winter but my produce is still lasting. I did have to pick out about 10 carrots a few weeks ago that started to develop fuzz but the rest of the carrots where fine. I noticed the carrots that went bad had nicks in them. I haven't had any issues since. I am really happy with the way my carrots and beets are holding up. I had some other carrots/beets that were slightly damaged in an exposed box outside and they shriveled up within a month. 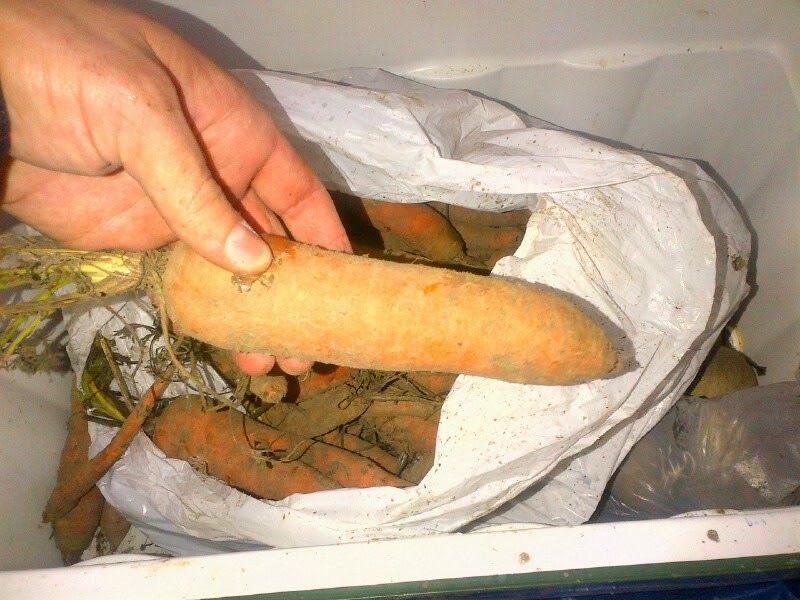 I also had the same issue with carrots stored in a refrigerator last year. Shriveled up carrots are not that appetizing. Produce in a plastic bag. 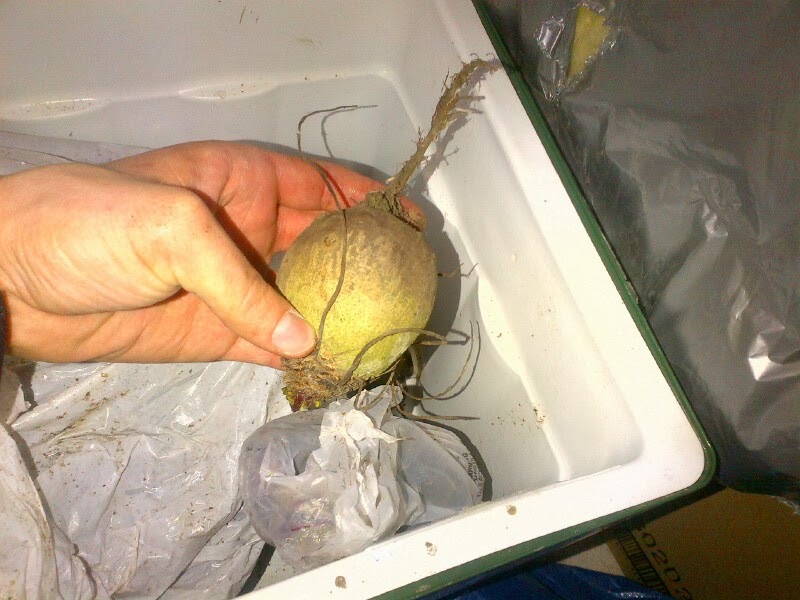 Once the outer skin comes off, that beet is as good as new. That is how I have been storing my fall produce this year. Next year, I am going to improve my system by using boxes/coolers full of sand to put the produce in or I was thinking about building sort of a box within a box to store produce. The inside box would be big enough to hold the garage sale coolers/boxes. The outside box would be big enough to allow dirt to be shoveled in to fill in the area between the outside box and inside box. The dirt would act as the insulator to hold any heat given off from the outside wall of the house. The whole set-up would be covered with blankets or spare insulation. How do you like my set-up this year? What do you think about my ideas for next year?